Happy Tuesday everyone... I'm up on the Newton's Nook Design Blog today with a Cute Newton card perfect for Fall. I started with a piece of watercolor paper and I added some Tumbled Glass Distress ink to the background. Then I added some of the leaves from the NND Falling Leaves Stencil. I used some mini ink daubers and Distress Oxide Inks to select certain areas of the stencil. Once the panel was dry I added some water splatters and heat set the panel with my heat tool, this creates the Oxide effect. I added some Peeled Paint Distress Oxide Ink to a piece of Woodgrain cardstock and die cut it using the Land Borders die and a stitched Rectangle. I adhered it to the lower edge of the panel. I adhered the panel to a Yellow card base and then I stamped the sentiment from the Autumn Newton Stamp set in the upper corner. I stamped Newton from the same set onto some Watercolor paper and Colored him in with Distress Ink markers and a Water-brush. I used the coordinating die to trim him out. I adhered the image to the card front with some foam tape. You can see more details on how I created this card in the video below... and be sure to stop by the Newton's Nook Blog for lots more inspiration from the Team! 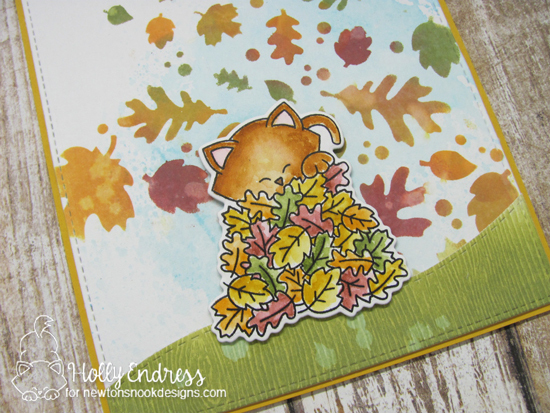 This is such an adorable fall card! 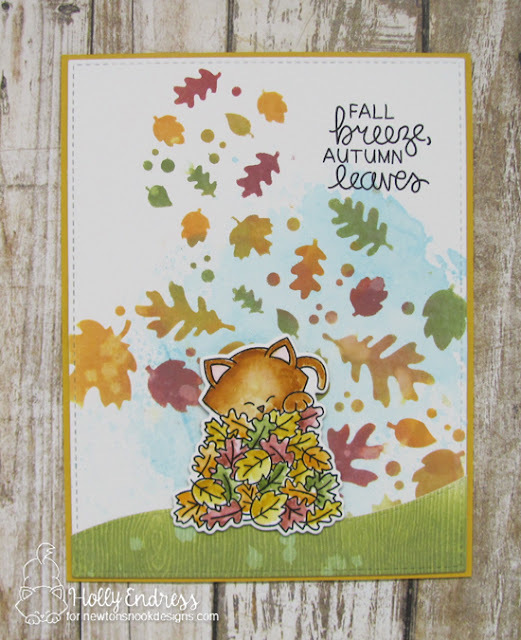 That's an adorable fall card ! I love Newton in this pile of leaves !